This black tuxedo style (the back center is 10" longer than the front center) evening jacket is by Betsey Johnson Luxe, which is a line of high quality, sleek garments. It's 97% rayon and 3% lycra and the satin is 100% polyester. It has shoulder pads and 4 satin covered buttons down the front and 3 smaller ones on each long sleeve. 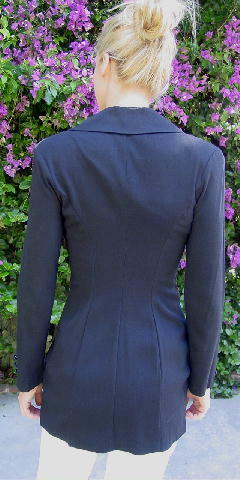 The lapels and inner front sides lining are also satin. There is an extra large and small button sewn on an inside side seam. It's from a European model who wore it to a foreign movie premiere. shoulder pad to shoulder pad 17 3/4"
shoulder to bottom back side seam 30 1/4"
shoulder to bottom front center 20"
armpit to armpit 16 1/4"